This video demonstrates a minimally invasive aortic valve replacement and hemi-arch replacement procedure. The patient was a 85 year-old man who initially presented with breathlessness. He had a known aortic stenosis, associated with a 5 cm ascending aortic and proximal aortic arch aneurysm. His aortic stenosis was severe with an aortic valve area of 0.5 cm2. 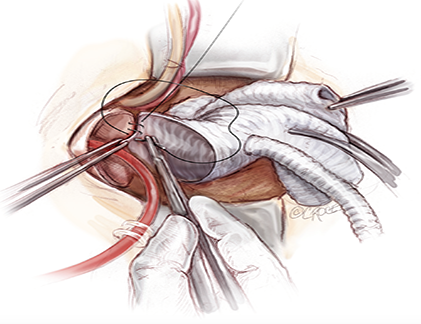 He underwent this mini-AVR and hemi-arch replacement procedure via a 5 cm incision. He did not require any transfusion (Video 1).